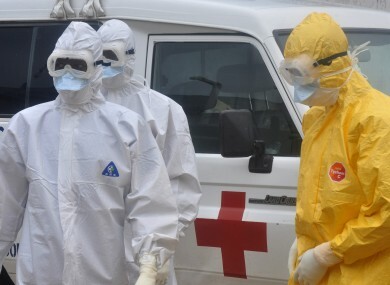 Health workers in protective gear wait to carry a body of a person suspected to have died from Ebola in Liberia. WHEN A MAJOR incident or event happens, you can be certain that someone will try to profit from it. The latest example coming from a US company called Blue String Ventures, which has found a way to use Ebola, the virus that has claimed more than 4,000 lives this year, to their own advantage. It currently owns the domain name Ebola.com, and is offering to sell it for $150,000 (€118,500). The president of Blue String Ventures and the owner of the Ebola.com domain, Jon Schultz, told CNBC that it had “many inquiries” about the name over the years, but none which lead to a sale. “Ebola.com would be a great domain for a pharmaceutical company working on a vaccine or cure, a company selling pandemic or disaster-preparedness supplies, or a medical company wishing to provide information and advertise services,” says Schultz. Schultz says he bought the domain name back in 2008 for an undisclosed sum with his business partner Chris Hood. They’ve also bought other similar domain names like BirdFlu.com, PotassiumIodide.com (which is used to fight radiation-induced cancer if an attack on a nuclear power plant or nuclear bomb fallout occurred), Fukushima.com and GreenCoffeeExtract.com among others. Those who visit the page Ebola.com will be greeted by a basic website with states “This website is currently being developed.” The site also has a link allowing visitors to donate to Doctors Without Borders, and an Amazon widget advertising books on the subject. Email “Someone bought ebola.com and is trying to sell it off for €118,500”. Feedback on “Someone bought ebola.com and is trying to sell it off for €118,500”.